Welcome to The Ring Adviser's Weekly Diamond Finds. Twice a week we will simulate a popular engagement ring choice and go through the process of determining what the best diamond would be. If you would like to send us a suggestion for a future installment or would like our personal one-on-one help, Contact Us. We will try and maximize size, so right off the top we will focus on a Color range of I-K. Clarity will be set as VS1-VS2, you should see some savings here and the difference is unnoticeable to the eye. With those settings set, we have four diamonds over .8 Carat to choose from. While all 4 diamonds are beautiful, we can whittle this down a bit more. Princess - 4: Has a POLISH rating of Very Good, below the Excellent rating of the other 3, so we will eliminate it. Princess - 1 & 2: While all remaining 3 diamonds have some blemishes visible on their table, 1 & 2 appear to be more prominently visible. Since a Princess cut has such a dominant Table, any blemishes there are a priority. Princess - 3: While our 3rd entry has some Faint fluorescence, that is not visible to the eye. Additionally, it's L/W ratio is not as good as the other three at 1.04, but that is a tiny difference. So what is the best Princess Diamond for under $2,000? Our choice would be the 3rd entry. Not coincidentally it is slightly more expensive than the others, just under our $2,000 threshold. Most importantly though is the clarity of the Table. 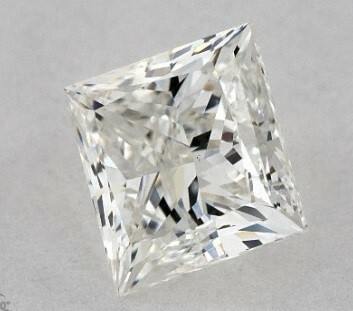 Plus, at .8 Carat with an I Color, it would be a real stunner with a deep brilliance. Would you like us to help you with your diamond ring search? Contact us and we will provide you with a one-on-one service that will get you the best diamond available!